My clients had a garden full of victorian features and focal points, but there was a lack of flow from feature to feature and with a planting scheme past its best. The garden wasn’t the shining glory the clients wanted it to be. During the client brief Arundel Castle was mentioned as a favourite spot. This gave me some inspiration for both additional features and planting, to make their plot a truly Classic Victorian Garden. There was nothing wrong with the main structure of the garden, so we decided not to change this greatly. But there was no path around the garden, which gave the feeling of separate features with no cohesive whole. We created a path to the ornamental pond with a rose arch. 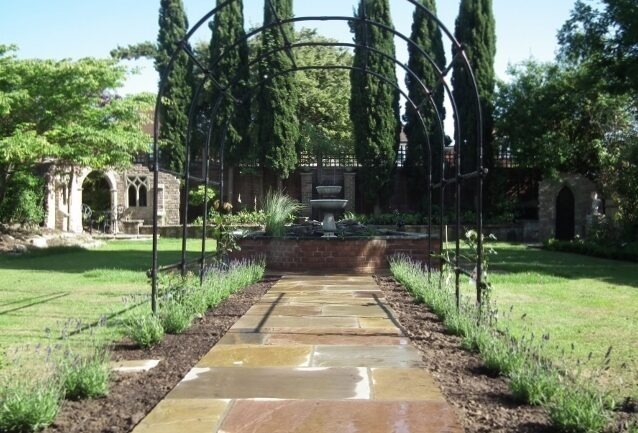 We introduced seating areas to catch the sun, a formal planting scheme and two Gothic-style follies by Redwood Stone to complete the wow factor. The rockery was rebuilt and replanted with rock plants that would not dominate the area, but would give a range of colour throughout the year and will carpet the soil and prevent weed growth. The row of tall Cyprus trees at the end of the garden gave great architectural structure to the end of the garden, we cleared the weeds and planted underneath with shade loving plants. The Pillars and the gate in the centre of the rear boundary are a real feature, a new mirror behind the gate reflects the garden and gives the impression of more beyond. We removed the wall bordering the patio and replaced it with bespoke open balustrades and the old two level patio was relaid as one large entertaining space, this opened the garden up so the planting is on view from the house. We straightened the borders along the remaining borders and edged them with box hedging to give a smart classic victorian look. The borders were planted with colourful perennials, to compliment the existing planting. The overall effect is smart and classic and the clients are thrilled.